There are times when every teenager in the world feels like an alien. But Mackie Doyle doesn’t just feel like an outsider; he knows he is different: not normal, maybe not even human. His sister Emma, four years older, says she remembers the night the real Malcolm Doyle, just a baby, disappeared from his crib, replaced by an odd pale boy with black eyes. Malcolm Doyle’s family raised the replacement and pretended nothing was different. But when your son can’t bear the touch of iron, from kitchenware to blood oozing from a scraped knee, and when he recoils in pain, skin blistering, when he tries to walk on consecrated ground—a church, a cemetery—you know there’s something wrong. 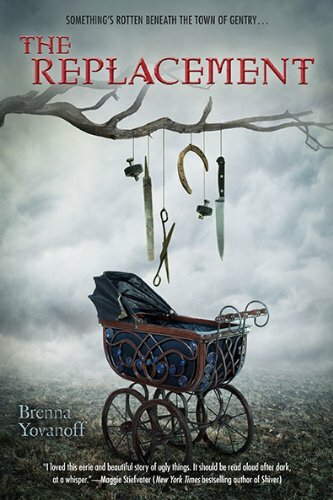 Despite the horseshoes over their doors and the bells hung instead of wind chimes, someone is stealing Gentry’s children—stealing them and leaving behind replacements who usually sicken and die within months. Why Mackie survived is yet another mystery. Right now he only knows that it’s happened again. Natalie Stewart, the three-year-old sister of Mackie’s classmate Tate, died—but Tate insists the thing that died wasn’t Natalie. Meanwhile Mackie’s feeling increasingly tired, his ability to cope with the presence of iron, to live in the human world, growing weaker. An odd stranger tells him he feels sick because he’s dying. A bottle of homebrew medicine from his sister’s weird friend Janice helps, but only temporarily. But then Mackie learns the truth: he is a “castoff,” a placeholder left behind when the mortal Malcolm Doyle was taken to satisfy a bargain made years before between Gentry’s townspeople and the unnatural beings who provide the town with its luck: no bad storms, no epidemics, no economic disasters. But more importantly, Tate’s sister really is still alive—but not for long. She’s due to be sacrificed on All Souls’ Day. “Only a small thing in the grand design of the world. One very small thing, every seven years. What a trivial cost to pay for health and prosperity.” But the more truth Mackie uncovers, the more he realizes he has to put an end to the kidnappings, the sacrifices, and the tribute that buy Gentry’s otherwise normal life. Even if it costs him his life. Yovanoff’s debut novel is written with grace and marvelous economy. Her characters are vivid and utterly believable, while the skillfully paced plot takes a familiar trope—the changeling looking for identity—and turns it inside out in a way that is both heart-rending and thrilling. Although billed as a young adult novel, The Replacement will resonate emotionally with both adult and teenage fantasy readers of this shadow-haunted story of secret bargains and sacrifices and the all-too-human longings to fit in and protect what’s closest to our hearts.